The associated trigram of this Poomse is Yin: the end of the beginning, the evil part of all that is good. Even in this darkness, there is still some light. Performing this palgwe, one should be aware that this is the last palgwe to be learned, it also is the end of a circle, and therefore it is also the first, the second etc. 35 Movements, 2 kicks, 7 punches, 2 keup. Ready stance (Joonbi). Moving left foot, turn to the left into a left forward stance (Ap Kubi). Execute a left down block (Arae Makki). Retract the left foot. Assume a left ease stance (Wen Seogi). Execute a left downward hammer fist strike (Me Jumeok Naeryo Chigi). Step forward into a right forward stance (Ap Kubi). Execute a right middle punch (Momtong Jireugi). Moving the right foot, turn 180°into a right forward stance (Ap Kubi). Execute a right down block (Arae Makki). Retract the right foot to assume a right ease stance (Oreun Seogi). Execute a right downward hammerfist strike (Me Jumeok Naeryo Chigi). Step forward into a left forward stance (Ap Kubi). Execute a left middle punch (Momtong Jireugi). Advance to a right forward stance (Ap Kubi). Execute a left palm heel pressing middle block and a right spear hand strike (Pyeon Sonkkeut Sewo Jireugi). Push the right hand slightly forward and twist the body counterclockwise. Quickly retract hand as if escaping from a grab, then place behind the lower back. As you retract your hand turn 360° counterclockwise, pivoting on the ball of the right foot, at the completion of the turn assume a right back stance (Dwit Kubi) and execute a left back fist (Deung Jumeok Bakkat Chigi). Advance to a right forward stance (Ap Kubi). Execute a right upper punch (Eolgool Jireugi). Yell (Kihap). Moving left foot, turn 270° counterclockwise into a right back stance (Dwit Kubi). Execute a left knife hand strike (Sonnal Bakkat Chigi). Turn to the right; shift the left foot inward slightly. Pull the elbow across the middle, the left knife hand aligned with the right shoulder to escape from a grab. Slide the left foot slightly forward into a horse riding stance (Juchoom Seogi). Execute a left side elbow strike (Palkup Yop Chigi). Shift the left foot assuming a left forward stance (Ap Kubi). Execute a left outward middle block (Momtong Bakkat Makki). Keep the feet in the same stance. Execute a right middle punch (Momtong Jireugi). Turn the body clockwise and step with the left foot up into a horse riding stance (Juchum Seogi). Place the fists at the left hip and execute a hinge block (Doltzeogi). Bring the left foot toward the right, into a close stance (Moa Seogi) then move the right toward into a left back stance (Dwit Kubi). Execute a right knife hand strike (Sonnal Bakkat Chigi). Shift to the left, move the right foot inward and pull the elbow across the middle, the knife hand aligning with the left shoulder to escape a grab. Slide the right foot slightly forward into a horse riding stance (Juchum Seogi). Execute a right side elbow strike (Palkup Yop Chigi). Shift the right foot, assuming a right forward stance (Ap Kubi). Execute a right outward middle block (Momtong Bakkat Makki). Staying in the same stance, execute a left middle punch (Momtong Jireugi). Draw the right foot a horse riding stance (Juchum Seogi), place both fists on the right hip and execute a right hinge block (Doltzeogi). Bring the left foot to the right into a close stance (Moa Seogi). Raise the left foot into a right crane stance (Hakdari Seogi), continuing to execute a right hinge block (Doltzeogi). With the right foot fixed, execute simultaneously a left punch (Jireugi) and a left side kick (Yop Chagi), landing in a left forward stance (Ap Kubi). 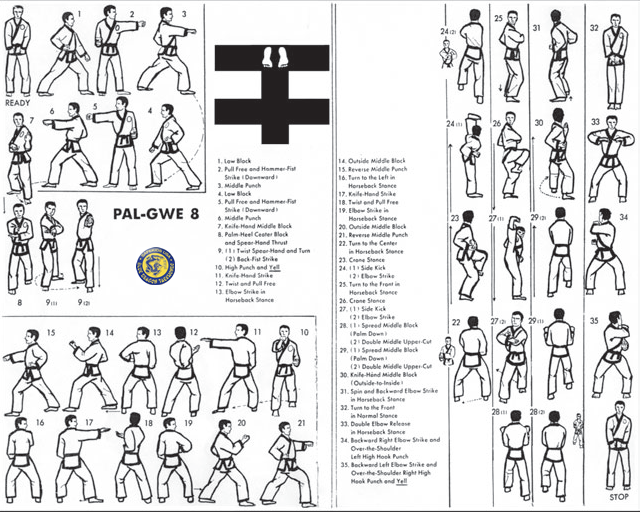 Execute a right elbow target strike (Palkup Pyojeok Chigi). Moving the left foot, turn 180° clockwise into a horse riding stance (Juchum Seogi). Place both fists on the left hip and execute a left hinge block (Doltzeogi). Raise the right foot into a left crane stance (Hakdari Seogi), continue to execute a left hinge block (Doltzeogi). With the left foot fixed, execute simultaneously a right punch (Jireugi) and a right side kick (Yop Chagi). Land into a right front stance (Ap Kubi), and execute a left elbow target strike (Palkup Pyojeok Chigi). Moving the left foot, turn 180° counterclockwise into a left forward stance (Ap Kubi) and execute mid-section opening block (Momtong Hecho Makki). Immediately execute a double fist uppercut (Du Jumeok Jecho Jireugi). Advance to a right forward stance (Ap Kubi). Execute middle section opening block (Momtong Hecho Makki). Immediately execute a double fist uppercut (Du Jumeok Jecho Jireugi). Advance to a right back stance (Dwit Kubi). Execute a left knife single hand middle section inward block (Hansonnal Momtong An Makki). The left hand grams and twist the opponent’s wrist, pulling it to the waist. Moving the right foot, turn 180° clockwise into a horse riding stance (Juchum Seogi). Execute a right rear elbow strike (Palkup Dwit Chigi). Slide left foot to the right into an overlapping hands close stance (Kyopson Moaseogi), with the open hands crossed in front of the groin area, left hand over right. Move the left foot to assume a horse riding stance (Juchum Seogi). Raise the elbows to escape from a rear grab (Meongeppaegi). Sliding the right foot slightly to the the right, execute a right rear punch over the left shoulder (Dwit Jireugi), while looking over left shoulder. Sliding the left foot slightly to the left, execute a left rear punch over the right shoulder (Dwit Jireugi), while looking over the right shoulder, yell (Kihap). Ready stance (Geuman) Keep right foot fixed, move left foot in.